Click on image to view article PDF. For hundreds of years, the craft of bead making has been a proud and well known tradition in Venice. Not well known, is that the bead makers in Venice and Murano, no longer use a mandrel. Instead, Venetians wind molten glass around a copper wire to form individual beads. After the beads have cooled, they submerge them in nitric acid to disolve the copper wire; leaving a clean hole. 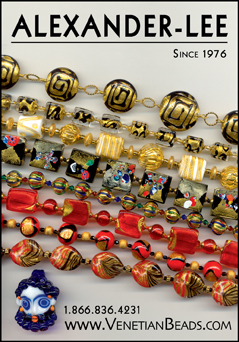 My husband, Phillip, and I started importing Venetian beads in 1976, and in the late 1980s introduced gold foil beads at the Tucson gem show. However, silver foil was not conducive to the acid method; a large percentage turned black around the holes, due to oxidation. We solved this problem by working with one of our innovative bead makers and created beads with white gold foil rather than silver. Twelve years ago, I was looking at an old "Vetrerie Moretti" color chart of Murano glass rods or canes and found a beautiful persimmon red hue called Rubino Oro. I asked one of our bead makers to have the Rubino Oro glass canes made and used over 24 karat gold foil; therefore creating the birth of Rubino Oro beads. For spring, we used the same Rubino Oro glass over white gold foil, to create a rosy pink color, thus introducing Rubino Platino beads. For this 18 inch necklace, I used a total of 18 beads with white gold foil combination of Rubino Platino and Champagne Pink. Note: The original article was printed in the premiere issue of "Bead Style Magazine, September 2003". 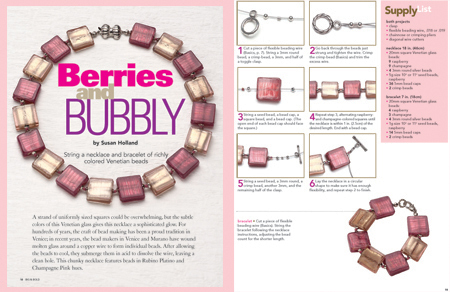 "Bead Style Magazine" contacted us in 2009 and asked to reprint the article in their new book entitled, "Big and Bold". "Ornament Magazine", Advertisement, 2009, Volume 32, No.5.